Wow! This is awesome! Pls let me know if there’s anything I can do to help you. I got burnt when I was only 2 yrs old to 75% of my body. I was also one of the speakers at the Canadian Burn Conference. Hi Kelly, thank you for your kind words. And I definitely remember you at the conference. I’m not sure if you remember me, but I sent you some pictures of you talking. I do have a particular idea of how you can get involved, and I’ll be emailing you shortly about that. However, if you could, just spread the word about the website to as many people as you can so we can spread awareness about resources for burn survivors. Hi Kelly, no we’re not Facebook friends yet, but I’ll have to add you because I have high privacy settings for my personal Facebook page. Also congrats on your nomination and good luck on winning – that’s amazing, you definitely are a great role model for young women. Also, if you haven’t already, please “like” and share the After the Cocoon Facebook page 🙂 (there’s a link on this page to it). Thank you again for your support in my project. Oh cool. I was wondering if that was you or not! Thank you for responding. Are we Facebook friends yet? If not we should be. There’s lots of stuff happening on my personal site. One thing I haven’t announced yet is that I’ve been nominated for a Queens Diamond Jubilee medal for all my work with teenagers and self esteem. I’ll know in Nov if I win or not. I loved the trailer you did. I’m also coming to Calgary this sun to speak for the Women’s Power Afternoon. What an awesome idea! 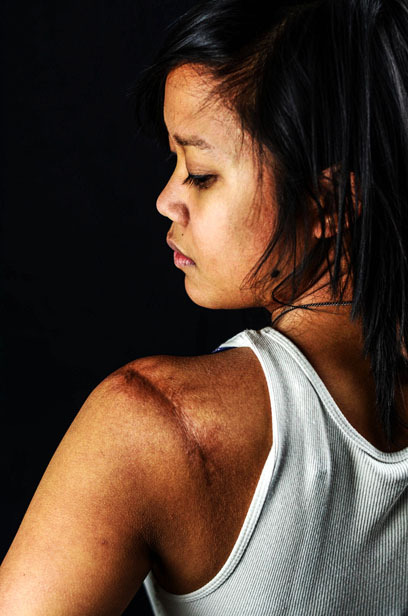 I am a burn survivor/acid attack survivor from the US. I’d love to help in any way that I can. I will definitely share the website information. Hi Karli, thank you for the comment and for sharing the website. Please like the Facebook page (http://www.facebook.com/afterthecocoon) and if you’d like to contact me, you can message me on the After the Cocoon Facebook page. I look forward to hearing from you! I am so proud to know you and of what you have created here. I think it is the MOST IMPORTANT AND RELEVANT SOCIAL DOCUMENT I HAVE EVER READ CONCERNING BURN SURVIVORS AND WHAT A TOUGH ROAD THEY ALL TRAVEL. This is not just important here in Canada but I thinks its relevance has no borders. You should be very proud of this and I know everyone who reads it will be touched by what a great message it delivers. Congratualtions again! Great to hear that this has reached different areas of Canada. Can you please send me an email at afterthecocoon@gmail.com? I look forward to hearing from you! You have made a beautiful and significant contribution here. I know a number of the survivors portrayed and you have truly captured their spirit and, yes, their sense of humour too. Thankyou, I will continue to follow along. Hi Greg, thank you for those words. Before I started the project, the thought of it was overwhelming. In retrospect I am incredibly happy with how it has turned out and hope to continue it indefinitely. I am currently brainstorming on ideas of what I’ll be doing with the project in the upcoming months. If you have any feedback I’d be happy to hear about it! Hey there Maria, we met at the Calgary Burn Survivors Conference. Great site, really impressive work. I would love to share this with my audience of the Maritime Medical Marijuana Show. I’ll promote this page, and be proud to do it. I guess I’m looking for your permission. Thanks ahead of time. Hi Chris, that would be great if you could share the website. Thank you for asking and good luck with your show(s)! Hi, my name is Becky and i am 29 years old. I just want to say how good it’s been for me to find your website. I am a mother to 4 children and currently 33 weeks pregnant with my 5th. At 2 years of age i was involved in an accident involving a faulty heating system, resulting in 60% of my body obtaining 2nd and 3rd degree burns. Having been discharged by my consultant at the age of 17 due to not needing anymore skin grafts, i never had any support regarding my scars during any of my pregnancies. Each one has got progressively more difficult to handle, probably due to my skin being more stretched. This particular pregnancy has been hard as i am carrying all out front and am definitely bigger! Because i have no contact with the hospital who dealt with my scars, my doctors are at a loss as to how to help me ease any discomfort, obviously with surgery not being an option whilst pregnant. I have been using Bio-Oil but its not giving me any massive relief. Do you have any ideas on what i could use to help me with the last few weeks? Hi Maria – I don’t know if you remember me (I used to volunteer with UW Peer Support), but I just wanted to commend you for such a beautiful project! All the best and keep being inspiring!